The two Equatorial Guinea-flagged poachers, Yongding and Kunlun, that the New Zealand Navy allowed to escape last month have been found again by the Sea Shepherd ship, Sam Simon. The poachers were found fishing with impunity only 50 miles offshore from Australia's Mawson Research Station, in waters claimed by Australia. When Sea Shepherd Captain Sid Chakravarty radioed them to cease and desist their illegal fishing activities, the Yongding turned onto a collision course with the Sam Simon. Unintimidated, Captain Chakravarty refused to yield, forcing the Yongding to turn away when only 10 metres from the Sam Simon and to flee northward. The Sam Simon is following the Yongding. Unfortunately the Kunlun was able to escape. The Sam Simon could only follow one of the ships. The Kunlun was last seen steaming north, away from the coast of Antarctica. It is very apparent that these poachers are aggressive and they are dangerous, so much so that they were able to fend off a New Zealand Naval boarding party last month. The captain and crew of the Sam Simon will not allow the Yongding to resume fishing. Captain Chakravarty has requested assistance from Australia but Sea Shepherd is not expecting any help from the Australian government. The poachers were caught fishing illegally in Australian waters. Sea Shepherd has the evidence. The vessels are listed as wanted by Interpol. The Sam Simon is willing to stick with the Yongding until Australia can intercept and arrest this pirate fishing vessel. Sea Shepherd does not have the authority to arrest the Yongding, but the crew of the Sam Simon are determined to stop any further illegal activity. If they drop a net in the water, it will be seized. As the poachers plunder the waters of the Australian Antarctic Territory, the Australian government's Southern Ocean patrol ship, Ocean Shield, remains in the tropical Indian Ocean, apparently on Operation Sovereign Borders duties to "protect" Australia from refugees that Prime Minister Tony Abbott says, "do not understand that Jesus said there is a place for everyone and everyone has their place and it's not everyone's place to come to Australia." We are assuming then that Abbott believes it is the place of the poachers to plunder Australian waters. He certainly does not view stopping them as a priority. "Despite a recommendation from the tri-partisan Southern Ocean Senate Inquiry, and Customs promising two 40-day patrols this summer, there is no boat on the horizon," said Greens Senator Peter Whish-Wilson. "The Liberal government has given a green light to pirates to damage the Antarctic environment." Instead of sending the New Zealand Navy back to sea, the New Zealand Foreign Minister, Murray McCully, said his government would be working with Spanish authorities to investigate links between the vessels and the Spanish-based criminal syndicate, Vidal Armadores SA. Those links are well established and despite that, this company has received millions of euros in European Union subsidies. Expecting Spain to intervene would have been like asking Al Capone to investigate the alleged criminal activities of the mafia. For some unfathomable reason the governments of Australia and New Zealand are either afraid to intervene or simply do not care enough to intervene. If Sea Shepherd can stop three poaching vessels from operating in the Southern Ocean, surely the navies of New Zealand and Australia could solve the problem, if they really wanted to. The Sea Shepherd ship Bob Barker continues to pursue the Nigerian-flagged poacher Thunder. The chase is now in its 48th day, the longest pursuit of a poaching vessel in history and there is little sign of it ending soon. The chase that began off the coast of Antarctica is now 750 miles southeast of South Africa. 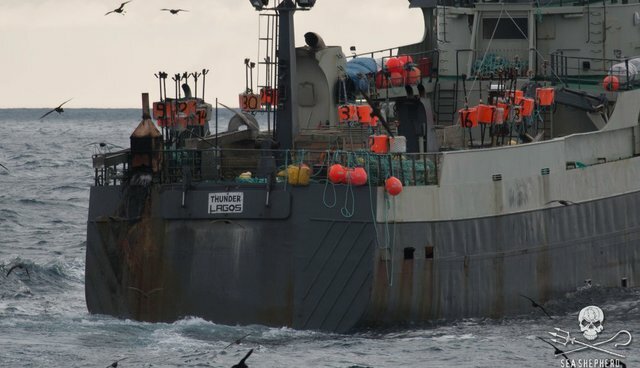 Last month the Sam Simon confiscated 72 kilometers of gill net set by the Thunder and tossed back a catch of toothfish worth in excess of $3 million dollars. Operation Icefish, which began in early December, continues off the coast of Antarctica with the Sam Simon and in the mid-Indian Ocean with the Bob Barker.